Houseflies are ubiquitous with a flight range of at least 5 miles. Eggs are laid in waste or similar media. Breeding generally ceases before winter however, in warm environments houseflies remain active and reproductive throughout the year. Flies transmit pathogenic protozoa, bacteria, viruses, worms, rickettsia and fugues. Flies serve as host for Staphylococcus aureaus, Salmonella entireties E.coli, Strep agalaciae and Strep agalctiae. As many as 33 million micro-organisms may flourish in a single fly’s gut, while a half billion more swarm over its body and legs. If a fly deposits one bacterium on a container of egg custard, at the end of 24 hours, that one bacterium will multiply to 280,000,000,000,000 bacteria – more than enough to cause food poisoning symptoms. A fly deposits thousands of bacteria each time it lands. When flies eat, they regurgitate an enzyme called volidrop, along with a portion of their stomach contents, which softens their food, making it easier to digest. 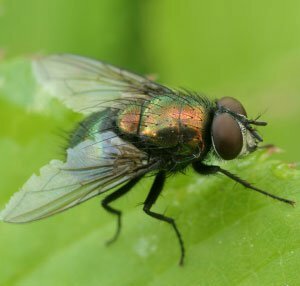 If you suspect you have a fly problem, call us for more advice on 01992 763776.